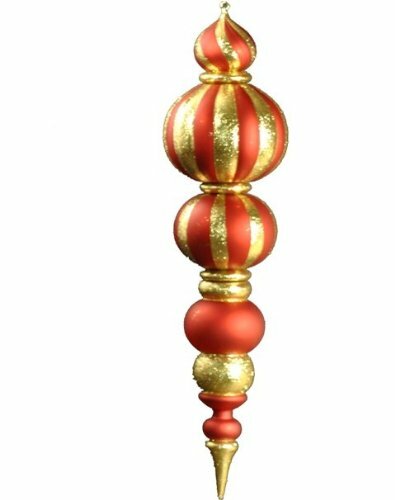 This large red and gold finial ornament is a great choice when decorating for the holidays, especially for larger, commercial areas. The finial is made of shatterproof plastic. It has been enhanced with glitter, giving it an additional sparkle look that really adds to its festiveness. Hang it from your ceiling, gutters and awnings, or use it to decorate your large Christmas tree. It is perfect for shopping malls and stores to catch the attention of customers. K/D style, meaning that it can be taken apart into smaller sections. This makes storage significantly more simple. It is 47.75" long and 11.5" wide.